Ryerson University Library and Archives (RULA) is pleased to participate in an exciting collaboration with Toronto Public Library and the University of Toronto that will enable Ryerson students to explore some of Toronto’s top cultural venues for FREE. To participate in this program, Ryerson students 18 years of age and over must obtain a MAP booklet from the Circulation Desk on the 2nd floor of the Ryerson Library. Students will need to present a valid student OneCard to receive a MAP booklet. 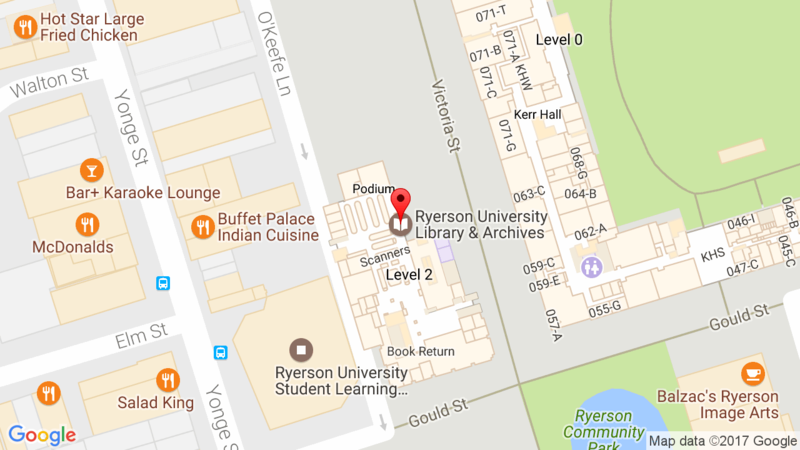 Upon obtaining a MAP booklet, students must then visit one of the five participating TPL branches (City Hall, Lillian H. Smith, Parliament Street, Scarborough Civic Centre and Toronto Reference Library) to “activate” their MAP booklet. In order to activate the pass, students need to have a valid Toronto Public Library card. Library cards are free to anyone living, studying or working in the City of Toronto. The pass is good for free admission for two to any one of seven participating MAP venues: the Art Gallery of Ontario, the Bata Shoe Museum, the Aga Khan Museum, the Royal Ontario Museum, Black Creek Pioneer Village, City of Toronto Historic Sites, and the Textile Museum of Canada.